A comforting pillowy-soft scent comprised of lavender attar, black amber and dry vanilla blended with sheer white musk and a gentle dusting of oakmoss. It works wonders when applied as a pillow scent or slathered just before bedtime. 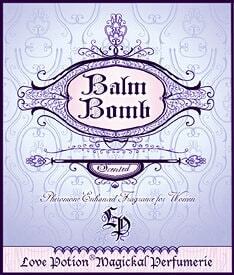 And it is the perfect carrier for our exclusive BALM BOMB pheromone formula. Crafted for the Ladies, but Gents may enjoy wearing this one too. OAKMOSS ~ Parental love, nurturing, soothing. Luck enhancing, financial success, protection, charity. VANILLA ~ Aphrodisiac, inspires happiness, playfulness, sexual arousal, lust, vitalizing, nurturing.